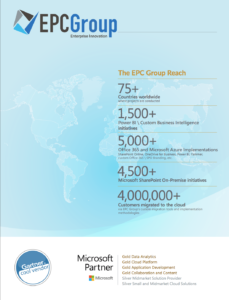 EPC Group’s extensive knowledge of the identity management covers Microsoft Identity Manager (MIM) as well as Microsoft’s latest technology roadmap updates. Microsoft has moved away from the Forefront product line and into Azure Active Directory. EPC Group’s consulting services cover all areas of Active Directory Federation Services (ADFS) as well as Windows Identity Foundation (WIF) and Microsoft’s new claims-first approach. EPC Group’s team can also provide you with the proper architectural design, implementation and any custom development you require via REST API endpoints and the Azure Authentication Library which allows for secure sharing of tokens for secure API calls to meet your organization’s most granular technical needs. Managing and securing information is vital to any organization’s success. EPC Group’s experts will deliver our “from the consulting trenches” methodologies and proven architectural strategies around federated identity management solutions for seamless authentication and authorization. EPC Group diligently implements sound solutions to address regulatory & security concerns and provides strategies to rectify and prevent productivity issues resulting from scattered sources of identity and security management. We understand compliance and the importance of an organization’s security infrastructure. Your organization’s information assets must be protected and EPC Group understands the level of information protection required to meet your needs.